Oranges are mentioned in ancient Chinese writings as early as 2400 BC, and, like most citrus fruits, were heavily traded and widely popular as a food and a fragrance. It takes 1,000 lbs. of fresh oranges to make 10 lbs. of Orange Oil. NOW® Sweet Orange Oil is naturally cold-pressed from fresh orange peels. This essential oil is 100% pure. Fun fact: On Chinese New Year, oranges are given as gifts to symbolize happiness and prosperity. 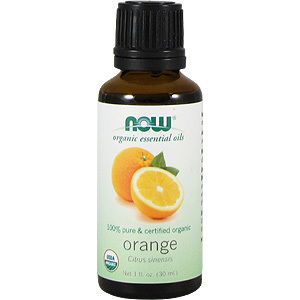 Orange oil is one of the best aromatics for the beginner. Besides lending a quality ambiance to any environment, orange oil is basically foolproof to use. It mixes well with many essential oils, plus softens and warms up the blend. It also has a variety of therapeutic uses, from relaxing mind and spirit to boosting circulation to protecting wood. It's user-friendly in nature, and inexpensive to keep on hand. Historically, oranges have been associated with generosity and gratitude, and symbolized innocence and fertility. Native to China and India, oranges are now grown in abundance in the Americas, Israel, and the Mediterranean. Mixes well with: Almost all essential oils, but especially well with allspice, anise, basil, bergamot, cinnamon, citronella, clary sage, clove, eucalyptus, frankincense, geranium, ginger, grapefruit, hyssop, jasmine, juniper, lemon, marjoram, oregano, neroli, nutmeg, palmarosa, patchouli, rosewood, sage, sandalwood, and ylang ylang. Safety Information: Do not apply before going out into sunlight. Highly sensitive people should perform a patch test. Essential Oils are the naturally occurring volatile oils obtained by steam distillation or cold pressing (expression), having the characteristic aroma of the plant part from which it was derived. These 100% pure oils are “neat”, meaning they have not been processed, diluted or manipulated in any way with solvents or other additives. Although a particular species of plant harvested and distilled for its essential oil during a particular growing season in a specific region may produce a fragrance that differs from the same species grown in a different region, many of the main chemical markers and physical specifications may be very similar. NOW’s citrus fruit essential oils are 100% cold pressed. Our other essential oils are typically 100% steam distilled. Do essential oils have a grading system to tell me which is better? There is no official grading system that grades essential oils as A, B, C or Therapeutic grade. All NOW 100% pure essential oils are accurately labeled as such and are the highest purity and quality available. Are NOW essential oils pure or do they have anything added to them? All of our 100% pure essential oils are labeled as such. 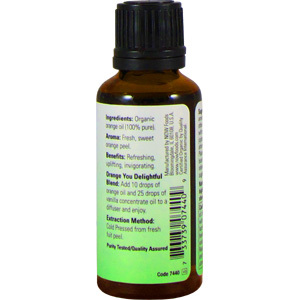 We also sell clearly labeled oil blends that are formulated with essential oils or absolute extracts and another oil as a base, usually pure grapeseed oil. Natural Essential Oils by their very nature will vary slightly from season to season. We allow nature to take its course and do not add isolated compounds to the oil to try to standardize the naturally occurring variations of a particular oil. We take both the organoleptic (sight, smell and taste) and chemical properties into account when selecting and testing NOW essential oils. What are NOW’s criteria for testing essential oils? Our Quality Assurance and Quality Control departments adhere to specifications used by the Essential Oils and Flavor Industry and published in The Essential Oils by Guenther, as well as Fenaroli’s Handbook of Flavor Ingredients. These texts, as well as other sources of scientific information, detail specific physical and chemical properties of a particular oil. A partial list of the components that we analyze include Specific Gravity, Refractive Index, Optical Rotation, Flash Point, Infrared Absorption (as published in FCC), Solubility, Taste/Odor, Color/Appearance, Heavy Metals and Predominant Active Chemical Components. Our in-house laboratory employs state-of-the-art analytical equipment that allows us to perform highly specialized analyses, such as Gas Chromatography and Infrared Spectrometry. We use our own analysis results to confirm specification sheet results and certificates of analyses received from 3rd party outside laboratories and vendors. As always, when it comes to Essential Oils, individual practitioners and consumers will decide for themselves which variety of a flower or leaf produces the essential oil that best suits their particular need. With NOW 100% pure essential oils, you can be assured that you have the real thing. NOW Foods is committed to offering the purest and most potent natural Essential Oils available. All of our 100% Pure Essential Oils are FCC or food grade and derived through natural distillation or cold pressing methods without chemicals or solvents. My family and I have been using Cassia essential oil topically on our feet. Is this OK since your bottle says “Not for Topical use”? Skin irritation is possible with many essential oils, including Cassia or Cinnamon. Though many people do use our oils in a variety of ways, due to the powerful nature of steam distilled pure essential oils we label these products with cautions and suggest that you consult an aromatherapist or health professional for proper use. There are many good reference books on using essential oils safely. These 100% pure oils are of the highest quality, undiluted and unadulterated. They are appropriate for any use where these concentrated oils are indicated, either for aromatherapy or with significant dilution per an appropriate recipe.